As many as 2000 people rallied today to support public use and ownership of public lands. Many went inside the Statehouse which is often referred to as the “Peoples House”. Please visit any time and please don’t hesitate to express your views. 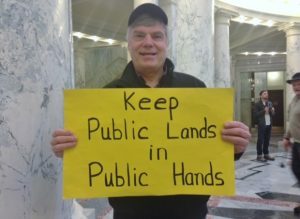 3 Comments on "Keep Public Lands in Public Hands"
I want them in “public hands” managed by the state of Idaho instead, with the help of forest management organizations that have long history of doing for us with our lands what is best for the overall population. Awesome! Thanks for being a leader!